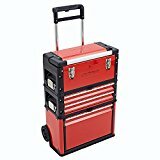 Incorporating four spacious drawers, this trolley tool box from Trueshopping provides an easy and convenient way to keep all your power and hand tools neat and organised. Suitable for both trade and domestic use, this four drawer trolley tool box has been fitted with heavy duty dual wheels and an aluminium telescopic handle for easier manoeuvrability, while the double metal latches ensure long lasting durability. This trolley tool box also includes a tote tray that’s ideal for smaller tools, while the easy access bottom bin is great for larger items.